Vigata and Montelusa are places that cannot be found on the map but which are geographically located in the area between the hill of Girgenti and the Sea of Africa.. Semi- imaginary places that are inexistant insofar as their boundaries can be moved according to the author's narrative needs but real at the same time: Porto Empedocle is Vigata with its streets, abandoned factories, Pasture, lighthouse, flat rock, Salita Granet, Marinella beach, "Commissariato" in Lincoln Street, Monte Crasto, Restaurant San Calogero and Trattoria da Enzo and Girgenti is Montelusa with the Commissioner's Office and Rabato district. Salvo Montalbano and the other members of Vigata's small police force. Mimì Augello, Montalbano's second-in-charge, Fazio, Gallo, Galluzzo and the incredibly stupid yet likeable Catarella, who mans the station's phones. Chauffer- driven. On demand we can provide English speaking driver/ guide and/or licensed tour guide. Time duration: the tour can be done in half day (about 3 hours) or a a full day (about 7 hours) a full day (about 7 hours) and it can be extended for 2- 3 more days to include the literary places described in the novels. 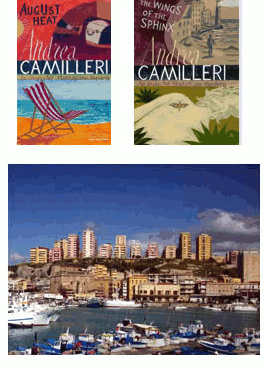 If you have a favourite Montalbano novel let us know and we will arrange a custom tour for you.